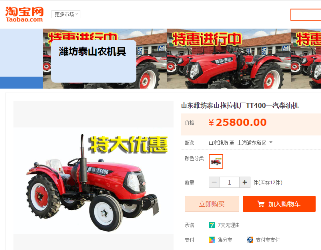 To give China’s small farmers greater access to the products they need to run their businesses, Taobao Marketplace, the C2C shopping platform owned by e-commerce giant Alibaba Group, has launched a shopping channel dedicated to the sale of products such as pesticides, fertilizers, seedlings, farm tools and even tractors. Data from Taobao shows China’s 700 million farmers are increasingly taking to the Internet to buy affordable goods for farming activities. By removing middlemen, farmers can find more options and better deals through e-commerce, according to Taobao. Taobao said by launching the specialized “vertical” site, it aims to support the entire agriculture supply chain, by not only providing farmers with access to quality inputs and advanced farming technology, but also by helping them to sell farm produce through Internet. The channel also plans to publicize planting and feeding indexes based on sales data collected through Alibaba Group platforms, as guidance for farmers’ production. To ensure quality and safety, Taobao says merchants must obtain government certification to sell seeds, pesticides, and veterinary drugs on the website. The channel is Alibaba’s latest initiative to expand e-commerce to the country’s vast rural areas. The company has built 1,803 village-level Taobao Rural Service Stations in 17 provinces, allowing local farmers to purchase goods from Alibaba’s retail platforms including Taobao Marketplace and Tmall.com. Taobao also disclosed it has partnered with the government of Shuyang County in Jiangsu Province, which is known for cultivating and selling seedlings, to establish a RMB 10 million fund ($1.6 million) to refine and regulate local seedling e-commerce. The fund will be used to pay refunds to farmers who receive inferior seedlings bought from Taobao shops operated by merchants in Shuyang. There are more than 10,000 Shuyang-area seedling e-tailers on Taobao. Since last year, Taobao has been working with the local government to inspect some 3,000 merchants and offer them training on Taobao regulations and Chinese law surrounding the sale of live plants. Taobao said it has reported 97 problematic merchants to local government, and settled 5,144 complaints from buyers.